Hey you! 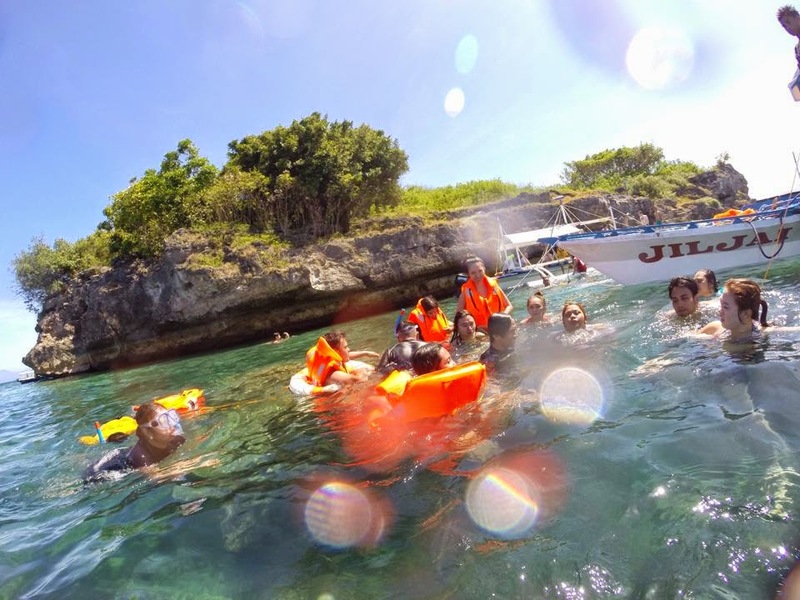 Welcome to part two of our Moalboal adventure aka our epic trip to Pescador Island! Anyone staying in Moalboal would be insane if they don't try to go to Pescador. 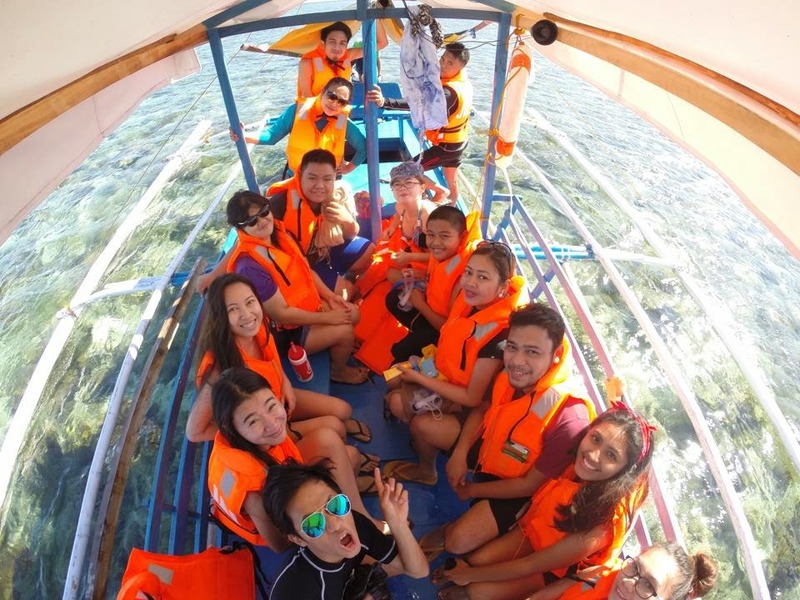 Located just off the coast, Pescador island is home to about 2,500 species of marine life (I'm not kidding, check Wiki!) including this crazy school of tuna fish. 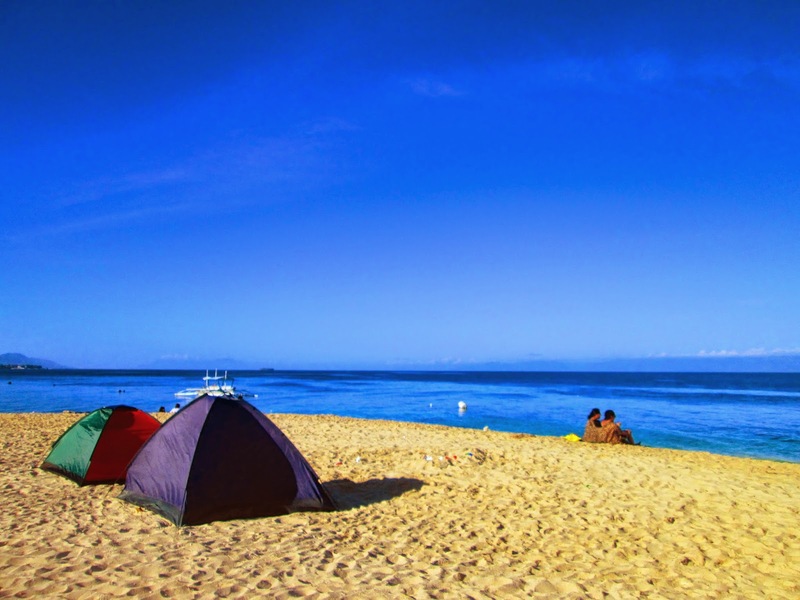 So if you love diving or snorkeling, then you're in for a treat. And since my friends and I were big on having fun at sea, we decided to get on a boat and check it out ourselves. Can't get enough of the sand. This was the early morning scene. Just lovely. Hi Anthony, how's the water? We were expecting a nice laid-back brunch waiting for us. When we went back to camp, however, we were promptly informed that, wait, we were going on a life-changing adventure after all! I was like, 'Gee, thanks for the heads up guys, I hope I can still return to the city with at least some spare change', thinking that the unplanned island hopping would rob me of my funds. But it turned out to be unexpectedly cheap. 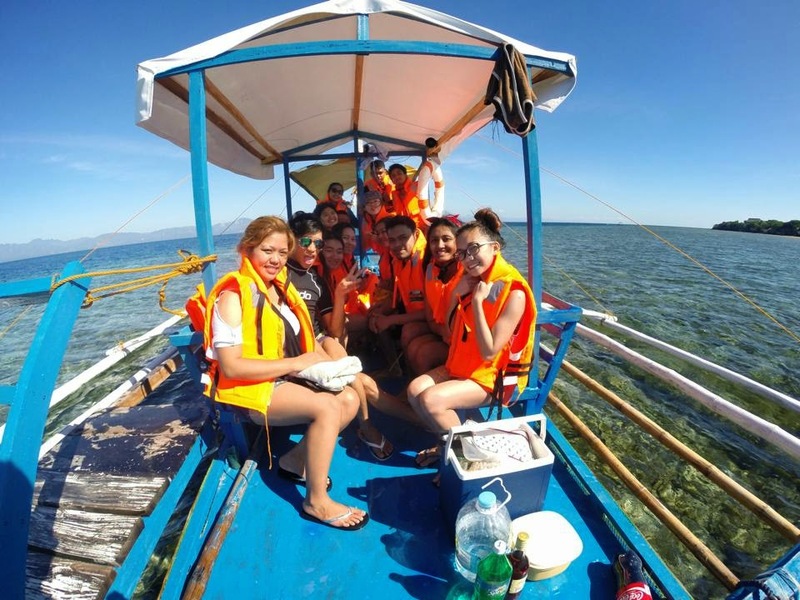 The guys at Bigsand let us have the trip---life vests for all of us and snorkel gear good for 5 people--- for only P2500. Not bad for 14 people. It was a tiny boat, but it held our fat butts just fine. After preparing some stuff, we were ready to set sail! Off to Pescador! It was a pretty long way to Pescador. Although admittedly, it was my first island hopping experience outside my home turf Mactan (I know, the blog is named island girl but I've basically stayed in one island most of the time, okay?) so maybe I just wasn't used to it. To pass the time, the friends and I subsisted on Cheetos and good conversation. And I think I fangirled over how pretty the sky and water was. I don't know if it's me living in Metro Cebu for most of my life but far-off places like these never fail to amaze me. I mean think about it, foreign tourists travel thousands of miles just to get to this island paradise that's practically in our backyard. Sometimes I can't believe places like Moalboal is just a couple of hours from the city. We're really flat-out blessed. And so after what seemed like a long stretch of beautiful blue skies and clear waters, we finally arrive! Remember that you won't dock onto the actual island. We dropped anchor around the perimeter along with other boats loaded with tourists. Once everything was in order, it was time to jump! Gotta thank our bro Ivan for these badass GoPro photos! The water was hella deep but I wanted to get rid of my lifevest. I might have just found Nemo. And Dory. And the rest of Nemo's buddies. If you know how to swim and aren't afraid to really go deep, get rid of the vest. At first I was kinda scared because I've never been in a spot in the water that's so deep and so alive. Definitely not kidding when I said I found Nemo and Friends. Wikipedia wasn't kidding too: Pescador was biodiversity. Fish, corals, anemones--- it was like being sucked into a NatGeo wildlife special. Scary and exciting! After we've gotten our bearings, all I really wanted was to divest myself of the vest and go dive deeper. Then I saw that somewhere towards our left was a drop off point, which kind of scared me again. I don't mean to be such a wuss but trenches are kind of scary like that. I hope that when I come back here, I'll be made of tougher stuff to conquer that kind of adventure. Oh, and about the vinegar? The water was itchy! Maybe it was all the marine life going on---like the algae or suspected jellyfish but the water around Moalboal and Pescador is itchy. Don't forget your vinegar when you go to these trips, as it helps alleviate the itch. Also if you can help it, get a rash guard. After diving and making fun of our friends who didn't know how to swim (hi Pearl and Tony! ), it was time to go back to camp. This time the waves got crazy! We arrived back around noon. We were starving from all the morning's activities and lucky enough, the guys back at camp had a big lunch waiting for us! Dig into the sa-ang baby! The sa-ang was fresh off the net! It was the best lunch of my life! After lunch it was time to say goodbye to the breather that was Moalboal. I loved every second of it! It was kind of sad to go back to the city but guess what, I was back in Moalboal a few weeks later. Can't stay too far from my true love! That's it for now! 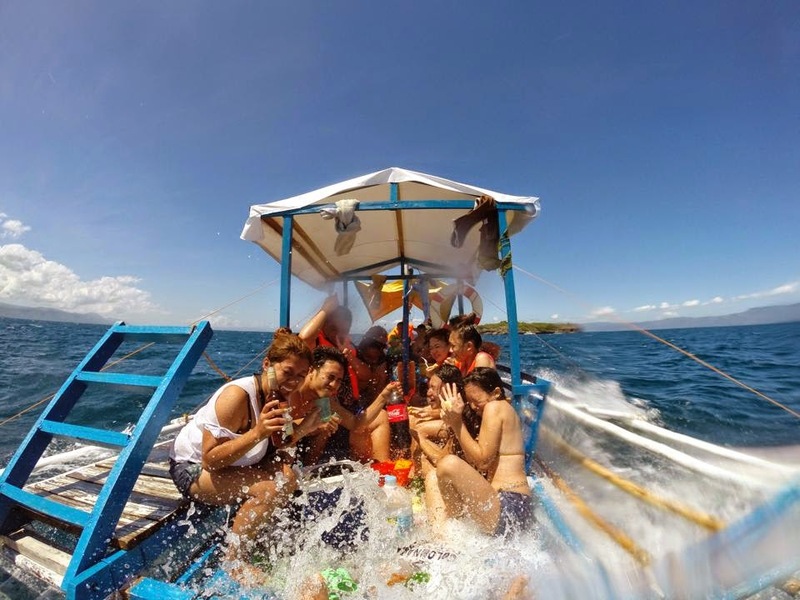 I hope you check out Moalboal and Pescador real soon!